I have a Ubuntu VM running on my Windows 7 machine. How do I set it up so that I can access the webserver externally through SSH? I found steps (Setup SSH access between VirtualBox Host and Guest VMs) to be able to ssh to my guest from my host, but that still leaves me with the problem of accessing it through my router. I suppose that I could install an SSH server on my Windows machine and then tunnel a few times (though I'm not 100% sure what to use in terms of local, dynamic, etc. or how to set up multiple tunnels? ), but is there a way to make the VM directly accessible to my router so I could directly port forward to it? The best way to login to a guest Linux VirtualBox VM is port forwarding. By default, you should have one interface already which is using NAT. Then go to the Network settings and click the Port Forwarding button. Add a new Rule. As the rule name, insert "ssh". As "Host port", insert 3022. As "Guest port", insert 22. Everything else of the rule can be left blank. Where user is your username within the VM. Change the adapter type in VirtualBox to bridged, and set the guest to use DHCP or set a static IP address outside of the bounds of DHCP. This will cause the Virtual Machine to act like a normal guest on your home network. You can then port forward. Keeping the NAT adapter and adding a second host-only adapter works amazing, and is crucial for laptops (where the external network always changes). 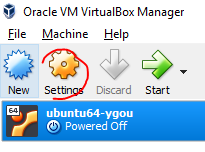 Remember to create a host-only network in virtualbox itself (GUI -> settings -> network), otherwise you can't create the host-only interface on the guest. VM's Settings > Network. First adapter should be Nat, second Host-only. Second adapter in guest should also be in 192.168.59.*. Check settings ifconfig -a. You should see e1000g0 and e1000g1. We are interested in e1000g1. You should see three interfaces like lo, enp0s3, enp0s8. We will use the third. You can also use a Bridged Network (or "Bridge Adapter", in newer versions) in network settings. This will put your VM in a VLAN with your machine. So you can just ssh into the VM like this. In order to ssh to a Ubuntu VM running in VirtualBox from your host machine, you need to set up two network adapters for the VM. First of all, stop the VM if not yet. Be sure that the SSH server has been installed and up running in the VM. The answers provided by other users here : How to SSH to a VirtualBox guest externally through a host? The key for me was to realize that ALL connections was PASSING-THROUGH intermediary devices to get from my remote PC to my guest virtual-machine at home --Hence port forwarding! Notes: * Need ssh client to request a secure connection and a running ssh server to process the secure connection. I will forward the port 3022 as used in the chosen answer from above. Enter your IPs where needed (home modem/router, host IP, guest IP,etc. ), Names chosen are just examples-use or change. 1.Create ssh tunnel to port 3022 on your modem's IP / router's external IP address. 4.Some suggest using Network Bridge adapter for guest = access to LAN and other machines on your LAN. This also pose an increase security risk, because now your guest machine is now exposed to LAN machines and possibly the INTERNET hackers if firewall not setup properly. So I selected Network adapter attached to NAT for less exposure to bridged security risks. Also there are different ssh servers and clients depending on platform using. That should be it. If I made a mistake or want to add anything -feel free to do so-- I am still a noob. Right-Click and select "Make bridge"
You can also initiate a port forward TO your HOST, OR ANY OTHER SERVER, from your Guest. This is especially useful if your Guest is 'locked' or can't otherwise complete the ModifyVM option (e.g. no permission to VBoxManage). Three minor requirements are 1) you are/can log into the VirtualBox Guest (via 'console' GUI, another Guest, etc), 2) you have an account on the VirtualBox HOST (or other Server), and 3) SSH and TCP forwarding is not blocked. 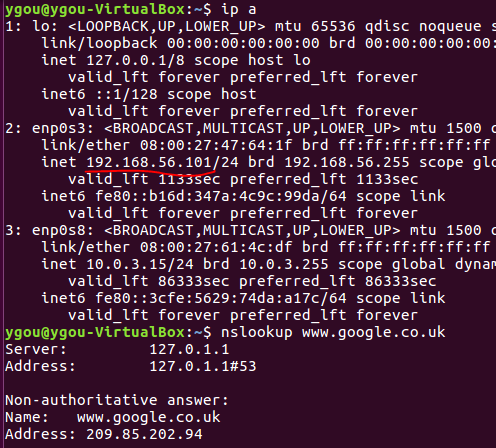 On the Guest, run netstat -rn and find the Gateway address to the default route destination 0.0.0.0. Let's say it's "10.0.2.2". This 'Gateway' address is (one of) the VirtualBox Host virtual IP(s). On the Guest, run ssh -R 2222:localhost:22 10.0.2.2 where "10.0.2.2" is the VirtualBox server's IP address -OR- any other server IP you wish to port forward to. Adaptor 1 (For internet access): Attached to -> NAT, Advanced -> Check the cable connected. Adaptor 2: Attached to -> Host only adaptor, Advanced -> Check the cable connected and Promiscuous mode -> Allow all. Login to the VM as root. Use this IP to open putty session for the VM. Configuration with bridged to see the server ip, and connect without "port forwarding"
Simply setting the Network Setting to bridged did the trick for me. Your IP will change when you do this. However, in my case it didn't change immediately. ifconfig returned the same ip. I rebooted the vm and boom, the ip set itself to one start with 192. * and I was immediately allowed ssh access. On secure networks setting your network to bridge might not work. Administrators could only allow one mac address per port or even worse block the port should the switches detect multiple macs on one port. The best solution in my opinion is to set up additional network interfaces to handle additional services you would like to run on your machines. So I have a bridge interface to allow for bridging when I take my laptop home and can SSH into it from other devices on my network as well as a host only adapter when I would like to SSH into my VM from my laptop when I am connected to the eduroam wifi network on campus. Use NAT network adapter and Add port forward. Mention actual host ip.Do not use 127.0.0.1 or localhost. Not the answer you're looking for? Browse other questions tagged ssh virtualbox or ask your own question. How to login ssh from windows host to Linux guest in Virtualbox?